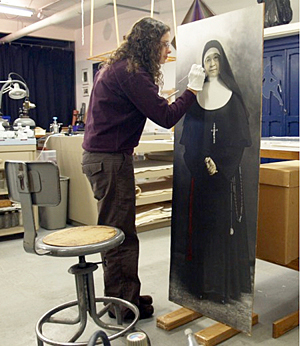 Lisa Duncan restores a life-sized portrait of Mother Concordia Puppendahl, the superior general for the Sisters of St. Mary. The photograph was taken in the studio of the Gerhard sisters, the first documented women photographers in St. Louis. 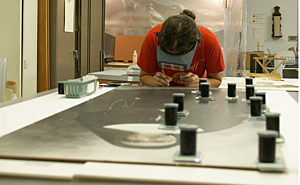 As part of her graduate internship at Heugh-Edmondson Conservation Services, LLC, in Kansas City, Lisa Duncan treats areas of the life-sized photograph that were badly damaged in shipping. Duncan works on the 1930 senior class photoboard from Park College in Parkville, Missouri, that was in a flood and badly water damaged. Duncan unmounts the images on the photoboard so they can be washed. Editor's note: The Winterthur/University of Delaware Program in Art Conservation is one of only five graduate-level conservation programs in the United States. Graduate students in the program spend their third year in an advanced internship at museums and studios around the world. Here, Lisa Duncan reports on her work at Heugh-Edmondson Conservation Services, LLC, in Kansas City, Mo. 9:36 a.m., March 19, 2009----I decided to spend my third year at a private practice conservation studio--Heugh-Edmondson Conservation Services, LLC, in Kansas City, Missouri. I wanted an in-depth experience treating damaged works on paper and photographic materials, and felt that having an intensive experience in private practice would even out my past museum experiences. Recently, I have been working on a life-sized portrait of a nun, Mother Concordia Puppendahl, the superior general for the Sisters of St. Mary congregation. It was taken in the studio of the Gerhard sisters, the first documented women photographers in St. Louis. The photograph was badly damaged when it was shipped to the studio framed. The glazing had broken, cutting the image. The bottom half of the image was badly damaged and sensitive to aqueous treatment, possibly caused by previous water damage in the past. Areas of detached emulsion were consolidated with gelatin, and gauges were filled with paper pulp and a baryta layer. The losses and fills were inpainted with Windsor & Newton watercolors. This was a challenging treatment due to the sheer size of the image and the amount of cosmetic damage. I have also been working on the 1930 senior class photoboard from Park College in Parkville, Missouri, that was in a flood and badly water damaged. 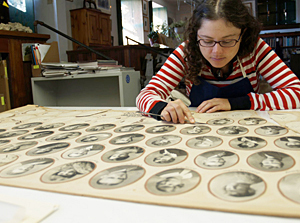 Photoboards were produced around the turn of the century until World War II. They are like a billboard. Photographs that were taken for the yearbook were cut out and pasted to a board for display. These boards would have been posted in a prominent place for all to see. This particular photoboard was in a flood when water breached the archive. One whole side was badly water damaged and one corner was completely detached. The treatment involved unmounting the images so that they could be washed. The facing paper was split from the wood core so that it could be mended and lined before being mounted in a new matboard and the photographs reattached to the board.